Group chat plays an essential role in the day of many product teams. Especially for distributed teams it often builds the backbone for communication. That’s why we set out to build the best HipChat integration for product teams out there. Here is what we came up with. HipChat is a simple group chat & instant messaging service for teams. One of the things that makes HipChat really special is its great cross platform support. Whether your team members use Macs, Chromebooks, Android, iPhones, iPads or Linux you will find a HipChat client for every major platform out there. HipChat allows you to easily upload and share files via drag & drop. This is a great way to get quick feedback on design mockups and screenshots. The service also offers a huge set of over 150 emoticons to add fun and depth to conversations. You can even upload your own emoticons as well. These features alone make HipChat a valuable tool for product teams but where the service really shines are its integrations with other products. 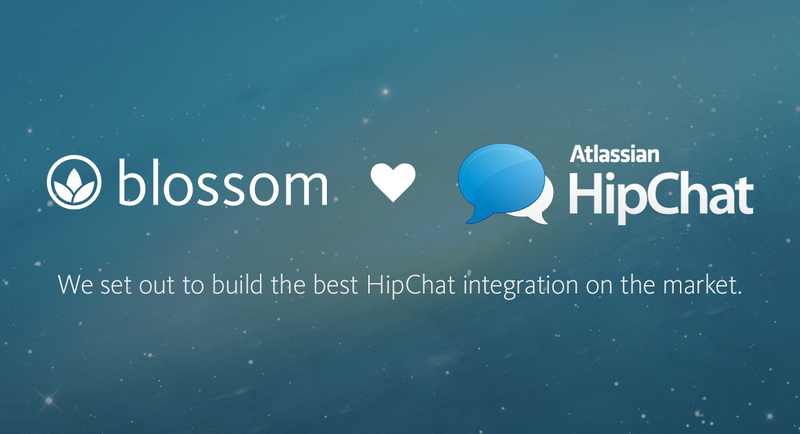 Since we are happy HipChat customers ourselves we’ve put a lot of thought into how an ideal integration between Blossom and HipChat would look like. Here is what we came up with. You can now connect individual Blossom projects to HipChat rooms. Once connected we will send a message to your team’s group chat every time something interesting happens in your project. This way you will get informed about useful things like added comments, file attachments, completion of checklist items and card movements. If you click on the link from a HipChat message it will lead you directly to the card in your Blossom project. HipChat will even notify you when important events happen. For example if a feature you are working on is finished and ready to be deployed you can just mark the card as ready to let everyone know. Also whenever someone in your team encounters a problem that is blocking progress on a feature just mark the card as blocked to let your team know about it. This is a great way to stay in the loop even when you are on the go. Let’s take a look at how to set it all up. Just open the settings drop down in the Blossom project which you want to connect to your HipChat room. Fill in your HipChat auth token and the HipChat room name or ID that you want to connect to. If you are a HipChat group admin you can create a notification auth token at http://hipchat.com/admin/api. Finally connect your project to HipChat and you are good to go. You will see a confirmation message posted to your room soon afterwards. We are really happy to make this feature available for all our customers starting today. Thanks a lot to all of our trusted testers and the great folks over at HipChat for making this possible. Connect one of your Blossom projects to HipChat and tell us what you think.